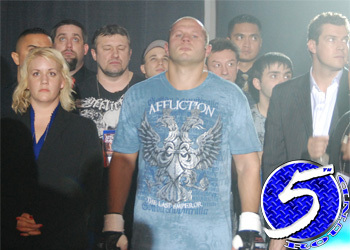 The biggest stalemate in MMA history will come to a head if Fedor Emelianenko walks away victorious at “Strikeforce: Fedor vs. Werdum.” At that point, fans are expecting Fedor to challenge heavyweight champ Alistair Overeem for his title in the most anticipated heavyweight scrap of all time. Therein lies the problem for the San Jose, California based organization. It’s been well documented how difficult it is to deal with M-1 Global, Emelianenko’s longtime management company, and one can only imagine the demands they might conjure up knowing that a mega-fight against Overeem hangs in the balance. Just to give you an idea of what Strikeforce is up against, Team Fedor insisted on renegotiating his contract immediately after completing the first fight on his deal. It took them at least three months to “tweak” the original three-event agreement they signed less than a year ago in order to arrange next month’s scrap against Fabricio Werdum. Kicking off the roadblocking festivities against Overeem is M-1 Global’s insistence the Dutchman submit to a third-party administered drug screening prior to facing their client. On numerous occasions, Vadim Finkelchtein, M-1 owner and Fedor’s go-to guy, has publicly accused Overeem of taking performance enhancing drugs – something that has drawn the ire of Mr. Ubereem. Much has been made of Overeem’s immediate exit from the U.S. after capturing the Strikeforce heavyweight title back in November 2007. Not only had he not been back to defend his crown until this past weekend, he turned into The Incredible Hulk during his absence which has many, ahem Team Fedor, questioning the legitimacy behind achieving that kind of natural growth in such a short period of time. Overeem admitted it’s not Fedor that’s handpicking his opponents, but it’s Finkelchtein’s meddling that is preventing fans from witnessing the blockbuster heavyweight bout. It has been heavily rumored that if Emelianenko is able to leave the HP Pavilion in San Jose victorious and unscathed, Overeem and Fedor could star in the organization’s first pay-per-view broadcast later this year. Immediately after steamrolling Brett Rogers Saturday at “Strikeforce: Heavy Artillery,” Overeem reiterated that HE isn’t trying to dodge, duck, dip, dive and dodge anyone, while taking a slight dig at MMA’s Terminator.